Ants are very strong. Have you ever seen an ant carrying food that is larger than its body in its jaws or many ants working as a team to carry a dead insect? What is the approximate maximum weight that an ant can carry? An ant of the Messor aciculatus species carrying a dandelion seed: An ant can carry an object that is even larger than its own body in its jaws. 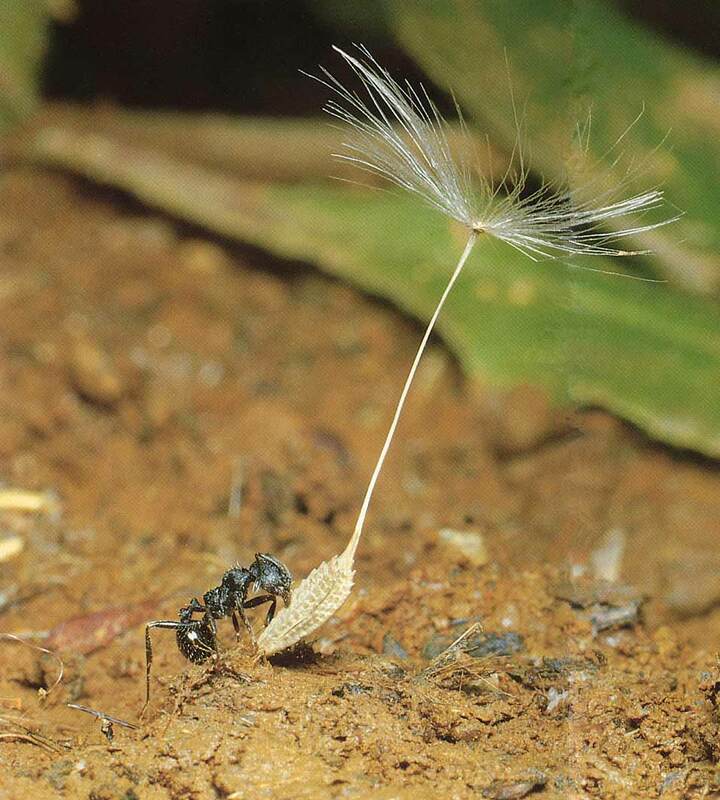 An ant of the Messor aciculatus species carrying a seed: Large ants usually carry food individually. In addition to individual variation and variation with castes, the strength used by ants when they carry food also varies considerably from species to species. In experiments using ants of the Formica japonica species, the ants were found to be capable of lifting an object weighing 5 times as much as their own weight at the maximum in their mandibles. Furthermore, it was also shown that an ant of the species is able to carry an object weighing up to 25 times as much as its own body at the maximum by dragging it along the ground to the nest. Variation with species is also seen in the method of carrying food to the nest. Large species carry food individually or by working as a team of 3-4 ants at the most. On the other hand, in small species, a team consisting of as many as dozens of ants carries the food, or tears the food into pieces and then carries each piece independently.